Something Will Come to Us ($15, ISBN: 978-1-937536-83-1, Hardcover ISBN: 978-1-68114-129-9, LCCN: 2014949808, 6X9”, 94pp, September 2014; Buy on Barnes and Noble or Amazon, or on Kindle for $2.99): a poetry collection about love, cats, dogs, the city and the country. 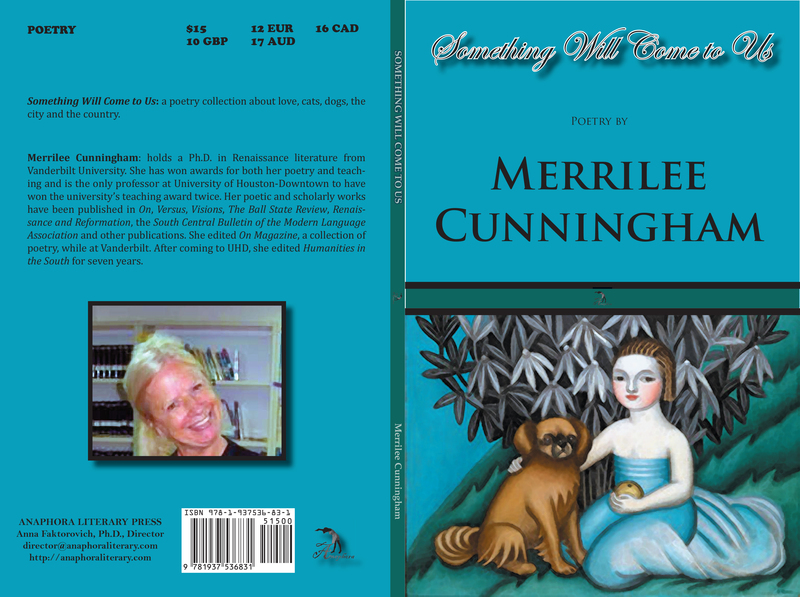 Merrilee Cunningham: holds a Ph.D. in Renaissance literature from Vanderbilt University. She has won awards for both her poetry and teaching and is the only professor at University of Houston-Downtown to have won the university’s teaching award twice. Her poetic and scholarly works have been published in On, Versus, Visions, The Ball State Review, Renaissance and Reformation, the South Central Bulletin of the Modern Language Association and other publications. She edited On Magazine, a collection of poetry, while at Vanderbilt. After coming to UHD, she edited Humanities in the South for seven years.